No longer just a place to work. The right office environment attracts business, facilitates communication, improves productivity, and conveys your corporate identity. Enhance your workplace experience with a design that fits the way you function -- one that's efficient, appealing and flexible enough to evolve with your business. 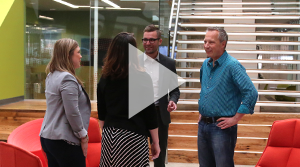 Hear our client describe how RDG’s design process challenged them to seek an open and collaborative corporate office environment, inspired a renewed level of energy, and transformed their office culture.